For other people named Geoffrey Taylor, see Geoffrey Taylor (disambiguation). Taylor was born in St. John's Wood, London. His father, Edward Ingram Taylor, was an artist, and his mother, Margaret Boole, came from a family of mathematicians (his aunt was Alicia Boole Stott and his grandfather was George Boole). As a child he was fascinated by science after attending the Royal Institution Christmas Lectures, and performed experiments using paint rollers and sticky-tape. Taylor read mathematics at Trinity College, Cambridge. His first paper was on quanta showing that Young's slit diffraction experiment produced fringes even with feeble light sources such that less than one photon on average was present at a time. He followed this up with work on shock waves, winning a Smith's Prize. In 1910 he was elected to a Fellowship at Trinity College, and the following year he was appointed to a meteorology post, becoming Reader in Dynamical Meteorology. 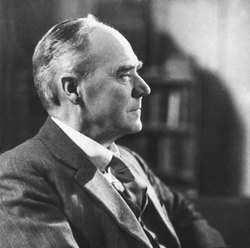 His work on turbulence in the atmosphere led to the publication of "Turbulent motion in fluids", which won him the Adams Prize in 1915. In 1913 Taylor served as a meteorologist aboard the Ice Patrol vessel Scotia, where his observations formed the basis of his later work on a theoretical model of mixing of the air. At the outbreak of World War I, he was sent to the Royal Aircraft Factory at Farnborough to apply his knowledge to aircraft design, working, amongst other things, on the stress on propeller shafts. Not content just to sit back and do the science, he also learned to fly aeroplanes and make parachute jumps. After the war Taylor returned to Trinity and worked on an application of turbulent flow to oceanography. He also worked on the problem of bodies passing through a rotating fluid. In 1923 he was appointed to a Royal Society research professorship as a Yarrow Research Professor. This enabled him to stop teaching, which he had been doing for the previous four years, and which he both disliked and had no great aptitude for. It was in this period that he did his most wide-ranging work on fluid mechanics and solid mechanics, including research on the deformation of crystalline materials which followed from his war work at Farnborough. He also produced another major contribution to turbulent flow, where he introduced a new approach through a statistical study of velocity fluctuations. During World War II, Taylor again applied his expertise to military problems such as the propagation of blast waves, studying both waves in air and underwater explosions. Taylor was sent to the United States in 1944–1945 as part of the British delegation to the Manhattan Project. At Los Alamos, Taylor helped solve implosion instability problems in the development of atomic weapons. In 1944 he also received his knighthood and the Copley Medal from the Royal Society. Taylor was present at the Trinity (nuclear test), July 16, 1945, as part of General Leslie Groves' "VIP List" of just 10 people who observed the test from Compania Hill, about 20 miles (32 km) northwest of the shot tower. In 1950, he published two papers estimating the yield of the explosion using the Buckingham Pi theorem, and high speed photography stills from that test, bearing timestamps and physical scale of the blast radius, which had been published in Life magazine. His estimate of 22 kt was remarkably close to the accepted value of 20 kt, which was still highly classified at that time. Taylor continued his research after the war, serving on the Aeronautical Research Committee and working on the development of supersonic aircraft. Though he officially retired in 1952, he continued research for the next twenty years, concentrating on problems that could be attacked using simple equipment. This led to such advances as a method for measuring the second coefficient of viscosity. Taylor devised an incompressible liquid with separated gas bubbles suspended in it. The dissipation of the gas in the liquid during expansion was a consequence of the shear viscosity of the liquid. Thus the bulk viscosity could easily be calculated. His other late work included the longitudinal dispersion in flow in tubes, movement through porous surfaces, and the dynamics of sheets of liquids. Aspects of Taylor's life often found expression in his work. His over-riding interest in the movement of air and water, and by extension his studies of the movement of unicellular marine creatures and of weather, were related to his lifelong love of sailing. In the 1930s he invented the 'CQR' anchor, which was both stronger and more manageable than any in use, and which was used for all sorts of small craft including seaplanes. His final research paper was published in 1969, when he was 83. In it he resumed his interest in electrical activity in thunderstorms, as jets of conducting liquid motivated by electrical fields. The cone from which such jets are observed is called the Taylor cone for him. In the same year Taylor received the A. A. Griffith Medal and Prize and was appointed to the Order of Merit. He suffered a stroke in 1972 which effectively put an end to his work; he died in Cambridge in 1975. ↑ O'Connor, John J.; Robertson, Edmund F., "G. I. Taylor", MacTutor History of Mathematics archive, University of St Andrews . ↑ Batchelor, G. K. (1976). "Geoffrey Ingram Taylor 7 March 1886 -- 27 June 1975". Biographical Memoirs of Fellows of the Royal Society. 22: 565. doi:10.1098/rsbm.1976.0021. ↑ Taylor, Geoffrey Ingram, Sir, Scientific papers. Edited by G.K. Batchelor, Cambridge University Press 1958–71. (Vol. 1. Mechanics of solids – Vol. 2. Meteorology, oceanography, and turbulent flow – Vol. 3. Aerodynamics and the mechanics of projectiles and explosions – Vol. 4. Mechanics of fluids: miscellaneous papers). ↑ "G.I. Taylor as I Knew Him". Advances in Applied Mechanics Volume 16. Advances in Applied Mechanics. 16. 1976. pp. xii–. doi:10.1016/S0065-2156(08)70086-3. ISBN 9780120020164. ↑ Pippard, S. B. A. (1975). "Sir Geoffrey Taylor". Physics Today. 28 (9): 67–61. Bibcode:1975PhT....28i..67P. doi:10.1063/1.3069178.